Do what you love is a concept that is tossed around all the time on social media these days. I agree with the concept but it becomes a thought form for the busy mind, not something that actually sinks in. 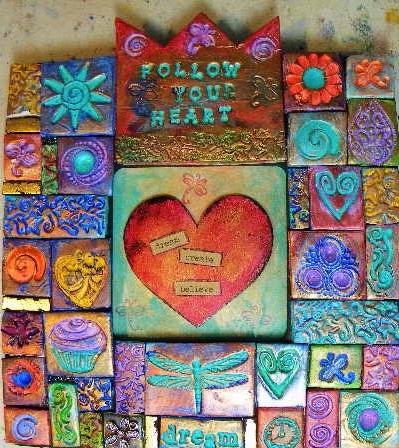 I make these inspirational wall plaques that say “follow your heart.” I do mean it, but what does it actually mean? I was at an event at a bookstore recently where I have some art hanging on display. I watched the people wandering around the walls, looking. There were those who threw a cursory glance at my art, and there were those who stopped at every painting and took in every detail. I’d say they liked my art, or they tried to figure out the technique. I have followed my urge to paint for a long time, and what appears on the canvas today is something I have developed over the years, and maybe there is more “heart” in my art than there was. I don’t know. All I know is that I’m on a journey that never stops as long as I can paint. My art will never stop developing, so if one of those people at the event would have approached me with questions, like “what inspires you”? I would have answered “many things.” There is no one thing in particular. What they actually see is my DOING over the years, with no particular goal in mind. I think the painter Paul Cezanne might be the father of abstract art when he discovered he could paint the loose rendition (or energy) of the landscape he was looking at. Discovering that took many years of DOING. 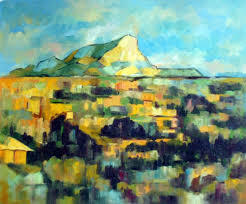 The issue was not to create a strong brand of Paul Cezanne, but the journey that led to his discovery of abstract ideas. Like most painters he probably took classes and experimented endlessly with color and form. His art became his brand, but I’m sure he would have resisted the word. The problem is: most people like to dream but not DO. It’s in the doing that all is revealed!! You can’t put heart in a box or on a wall plaque and hope it will transform someone, but my intention is to inspire. Still, the journey is mine. Every day is a day of DOING or not… your choice. By trusting, by taking action and not sitting on the sidelines you will in fact be led by the heart. P.S. I have lots of art for sale in my etsy shop Greene Earth Originals: HERE.